Should Indian IIMs be allowed to open campuses abroad? After keeping the MLAs waiting for 309 days, the Haryana Chief Minister, Mr Bhupinder Singh Hooda, today expanded his nine-member Cabinet with the induction of one Cabinet Minister and three Ministers of State, who were administered the oath of office and secrecy by the Governor, Dr A.R. Kidwai, at a function organised at Raj Bhavan here. 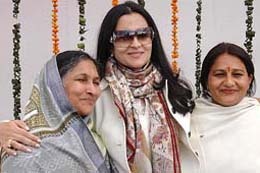 ‘United we stand’: The new Haryana women Ministers of State, Mrs Savitri Jindal, Mrs Kiran Choudhary and Mrs Meena Rani, seem to convey this message as they pose at Raj Bhavan in Chandigarh on Saturday. A US airstrike in Pakistan targeted Al-Qaida’s second-in-command, Ayman Al Zawahri, but it was unclear if he had been killed, US sources knowledgeable about the strike said in Washington. In a new twist to the case pertaining to the custody of Simran, a 13-year-old girl from Amritsar sought to be produced before the Supreme Court, which had found that the girl produced earlier was not the “real” child, her mother made a dramatic statement before it seeking withdrawal of the case. Prime Minister Manmohan Singh today said his government was willing to meet "all sections of public opinion" in Jammu and Kashmir in its efforts to reach a consensus on solution to the vexed problem in the state. Selection in India is a tough job because of the system of being voted in and out every year. I would prefer it if professionals were appointed and paid as is the case in Australia, New Zealand and elsewhere too. I think the captain or the coach at least one of them should have a vote. 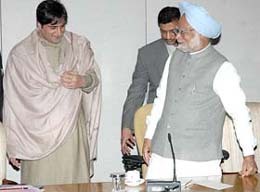 People’s conference chief Sajjad Lone being welcomed by the Prime Minister, Dr Manmohan Singh, just before a meeting on the vexed Kashmir problem at the PM’s house in New Delhi on Saturday. The Governor of Punjab, Gen S.F. Rodrigues (retd), today called upon non-resident Indians from the state to invest in the Chandigarh Capital Region through partnership ventures with focus on the social and rural transformation of Punjab. The anti-terrorism squad of the Mumbai police arrested Maulana Ghulam Yahya, a prominent Imam attached to the mosque at Haj House in downtown part of the city, for links with the Laskar-e-Toiba. Police said Yahya coordinated with a terror cell belonging to LeT in Kashmir and was planning an attack in Mumbai. TODAY is the Army Day. I have been getting its flavour for the last few days as my office is at the entrance of the Army parade ground in Delhi Cantonment, where a grand parade will be held to commemorate this occasion. Sitting in my office, the sounds of the men rehearsing, the bands playing martial music and the words of command of the contingent commanders, all reach me, some faintly but always in unison.